Well, the ridiculously long answer is outlined below, but the short answer is extremely simple. As Janet Marie Smith once said, “It’s not the steel trusses and brick arches that I think of as being the formula for [a ballpark’s success]. It’s rather the relationship to the city.” A great ballpark must be visually connected to its context both inside and out in terms of design, while also reflecting the region through other amenities like food. In other words, a good ballpark should represent its city. This page will outline the criteria I use in rating ballparks. Warning: this is ridiculously detailed. You may be asking, what’s the point of such a rigorous analysis of ballparks? I partly answer that in the introduction of this article, but I further outline my purpose and inspiration of this site here. Also, if you just want to quickly see the 18 categories and how much they’re worth, click here to see the summary at the bottom of the page. While there is a hard architectural slant to the criteria, we take all of the possible fan amenities into account as well. 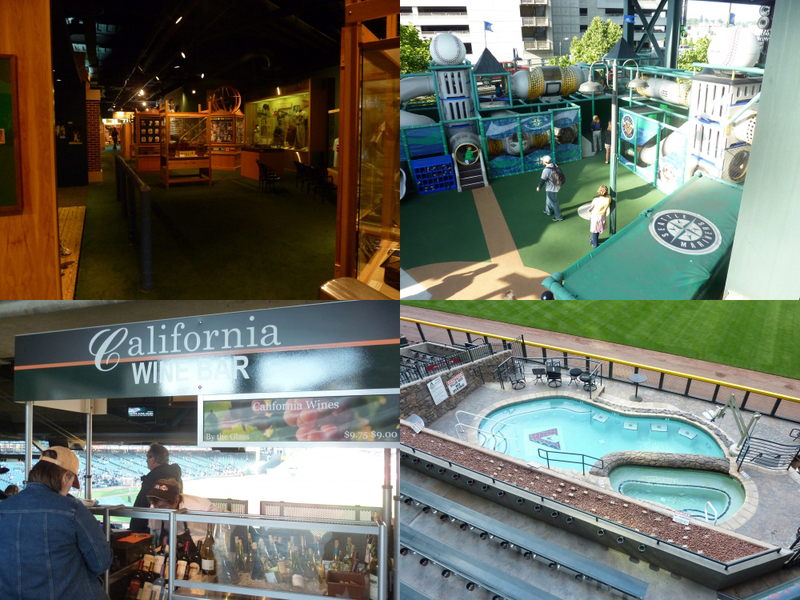 While I am a baseball traditionalist in many ways, I also love to look at how ballpark amenities have evolved. When judging a ballpark, I am not just a fan of baseball and architecture, but I also must look at the ballpark from a business perspective. So while many traditionalists deride the recent “mallparks,” I take a more pragmatic approach and reward such features. The ballpark has evolved into the comprehensive American playground, not just a venue for baseball. The very nature of the leisurely game of baseball means its venue is different. The ballpark, separate from the stadium, has to have entertainment options, open concourses, quality concessions, beautiful interior aesthetics, restaurants, flashy video boards, luxurious premium seating options, and team museums to keep fans occupied during the slow pace of the game. It’s not a coincidence that at ballparks, not stadiums, fans are encouraged to walk around and explore the game from different vantage points. HOK (Populous) coined the term “third-inning stroll”, where spectators are invited to leave their seats and explore the park. At ballparks, people are willing to wait a couple minutes for better food. At ballparks, we have the biggest video boards. At ballparks, we have the most kid friendly entertainment options. At ballparks, we have more references to history than stadiums. And it goes on and on. Baseball is different. The sad truth is, many people think baseball is boring. But the “ballpark,” which is truthfully a marketing ploy derived from the retro movement, has been transformed into a complete immersion experience for the average American. You go to the ballpark for the event and the aesthetics, not the game. Architects and owners hooked nostalgic fans in under the guise of retro, but it is economics, visuals, and entertainment that keep the consumers coming. 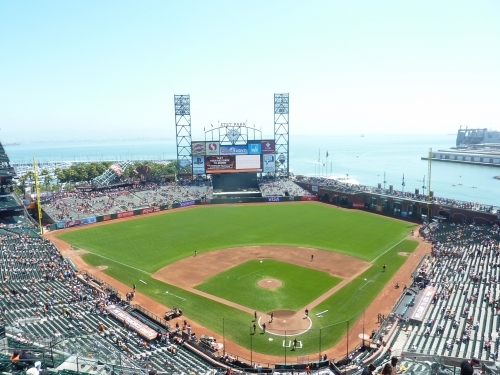 Ballparks built in the last 20 years are holistic experiences due to the nature of the game. Baseball museum at Turner Field. Playground at Safeco Field. Gourmet food at AT&amp;T Park. Pool at Chase Field. So, this site is a composite of all factors, weighted appropriately. However, the aesthetics of the ballpark are almost always placed above functionality when judging a ballpark as a symbol of civic pride. For example, PNC Park and AT&T Park are favorites and staples of the community because of the way they look on TV. However, a great ballpark is not just a piece of architecture. We systematically measure factors like sightlines and seat comfort. Not all ballparks are equally functional. That being said, we can’t score exterior/interior design the same value as say, fun stuff for the kids or signature food. So while, I am trying to stress these ballparks must be more than monuments, we can’t kid ourselves. On a 100-point scale, most of the categories are worth 5 points, but there is added or lesser value when appropriate. “Exterior Design” will be worth 10 points and “Interior Aesthetics” will be worth 15 points. I also added “Panoramic View,” worth 5 points, to supplement interior aesthetics, as it emphasizes the most important part of interior aesthetics: contextual integration. “Sightlines”, the most important functional aspect of a ballpark, is worth 10 points. Concourse design, which has both aesthetic and functional aspects, is worth 10 points as well. 3 points for the aesthetics and 7 for the functionality. I was originally going to count “ushers” as 5 points, but evaluating the friendliness of the ushers is too subjective, so I count “fan friendliness” as 2 points. “Regional Food” is 2 points as well (which supplements the “Concessions” score, emphasizing high quality local food), while “Entertainment” is 3 points. “Scoreboard” is worth 3 points. Every other category will be worth 5 points. All great ballparks need to reflect their cities, so that’s implicitly considered in many categories as well. I’ve now been to all 28 ballparks in the majors (I haven’t been to the multipurpose Rogers Centre or Oakland Coliseum, both of which don’t seem too important for “ballpark” ratings) so I generally know what to expect. The ratings are not done on a curve, thus, its possible for no ballparks to get the highest score. However, the highest standards are reachable. While there is certainly a lot of subjectivity involved, all of it is based on sound analysis, and most of the functional aspects are objectively measured. As it turned out, most of my analysis is mainstream and verifies the consensus, but there are multiple examples where I strongly deviate. One other thing: while I experimented grading Fenway, Wrigley, and Dodger Stadium, I use a different format with the classic ballparks. Comparing the old parks to the new ones isn’t remotely fair, even when they are retrofitted with modern amenities. Historicism still has an unfair impact on both and subjective and objective categories. We can have a conversation about Wrigley Field and Fenway Park (and I’d add Dodger Stadium), then we can have a separate conversation about the other 27 baseball stadiums. So when comparing “new” ballparks, you’ll often here me say “among post-1991 ballparks,” as that neatly leaves out the multipurpose stadiums and the classic ballparks. Here are the criteria. Don’t take the individual ratings too seriously; this should be used as more of a guideline. I will later release individual ballpark rankings based on each of these categories under the features section, i.e. “ranking mlb exterior designs.” I further expand some of these issues in the features section, but these are the 17 categories on which ballparks are judged. Have fun ballpark fanatics! Complete field visibility on 360 degree concourse at Target Field. Access/Location (x/5): A ballpark fitting in with its local surroundings is perhaps the foundation of the new retro aesthetic. This category also measures how easy it is to get to the park. I note the parking efficiency and the public transportation system. While sometimes the ease of getting to the park and the quality of the location do not coincide, generally speaking, if the ballpark is in a good area, it will be accessible. Some might argue that parking efficiency is inherently sacrificed in an urban park verses a suburban park, but that is not always the case all things considered. 1) What is the physical quality of the area? Is it near anything of interest near the ballpark? The quality of a location is measured by its proximity to other landmarks. Most urban parks score high in this category. 2) How does the ballpark fit in with its context? 3) How easy is the ballpark to get to (traffic considered) and how efficient is the parking if that’s the option most fans take? Both suburban and urban parks can score high here. 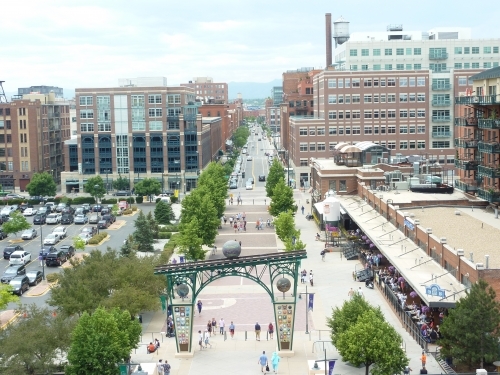 Local Scene (x/5): A ballpark’s location should be vibrant with local bars and restaurants accessible in the area. A fun and festive atmosphere is important for the symbiosis between the community and the ballpark. 2) What is the density of bars/restaurants/hotels in the direct vicinity to the park? 3) What is the density of bars/restaurants/hotels in the general vicinity to the park? 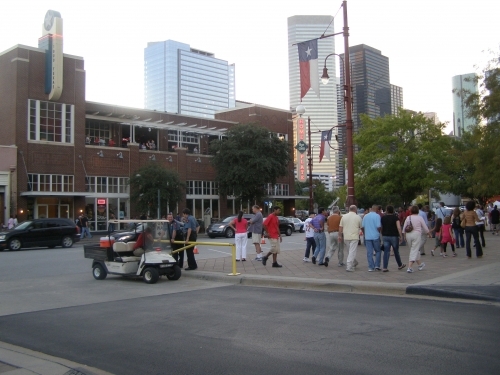 Urban area outside Minute Maid Park. Coors Field. LoDo is the king of ballpark local scenes. Exterior Design (x/10): While our nation’s venues aren’t held to the same standards as other public civic centers, this category really measures the structure as a piece of architecture. 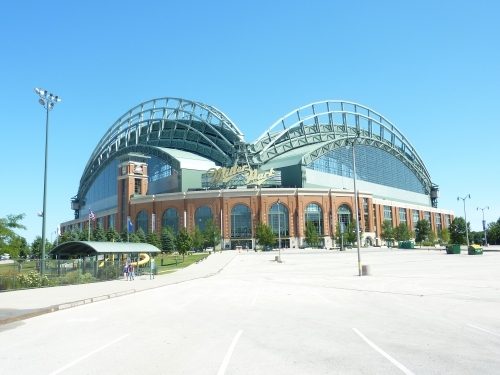 A ballpark’s outside appearance and façade should create an iconic image. 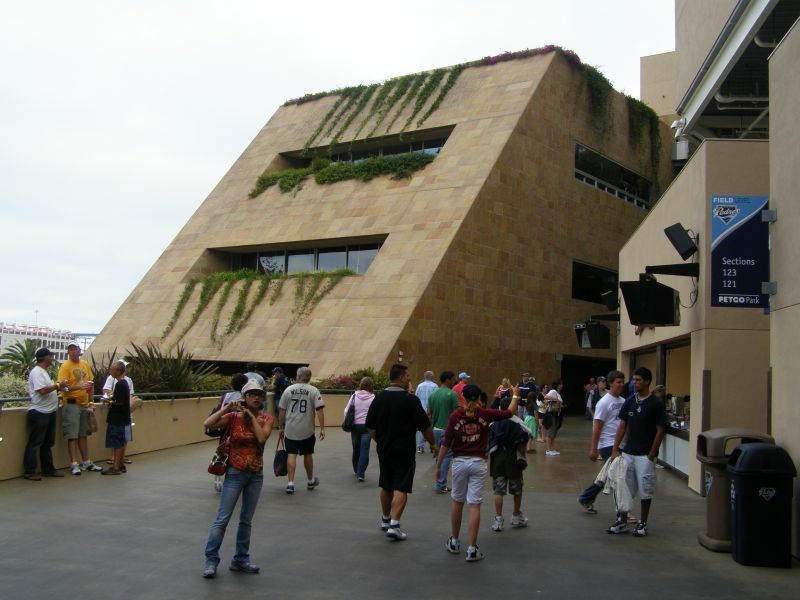 The exterior design should separate itself from other retro ballparks and fit in with its surroundings. “Signature entrances” and landscaping are considered as well. This might be the most subjective category, but ballparks based on tried and true architectural principles, not copycat retro Mcmansion architecture, have a significant advantage. It takes a keen eye, but there are both very good red brick designs and very derivative ones. For what its worth, this is also the only category where all new ballparks fall below historical standards. The streamlined retro mediocrity doesn’t come close to the nuanced artistic merits of a Shibe Park, Forbes Field, or Ebbets Field. And I’m not the type to blindly fall in love with “the old parks were better” argument. Shibe Park especially was far more ornate than anything we’ve ever seen, using a distinctive French Renaissance design with ionic pilasters, terra cotta, and cartouches. But even disregarding this outlier, the old ballparks generally had undisputedly more original facades. 1) Is the facade aesthetically pleasing and distinctive in comparison to its peers? 2) Was the design novel or innovative at the time of construction? 3) Does the façade fit in with its region and its environment? 4) Are there any signature entrances? 5) Does the landscaping around the exterior appropriately supplement the design? Interior Aesthetics (x/15): The interior of the ballpark is defined as everything inside the park not counting the concourses and aisles. It can range from the way the cross section/seating is arranged, (from a visual standpoint) to the nature of the outfield scene. Basically, it’s the seating structure to the outfield design. The outfield design can range from the dimensions to the visual features beyond the fences. 1) Does the interior design have a certain aesthetic vision or purpose? There should be an overarching concept to the design. Simply put: Was this designed to be aesthetically pleasing, regardless of subjective opinions? It shouldn’t just be a functional arrangement of stands, but something that was constructed with aesthetics in mind. We can apply this fairly objective measure easily. I think we can all agree that AT&T Park and Wrigley Field pass this test, unlike, say, Miller Park, on the inside at least. When I say aesthetic vision, I’m not talking about subjectively looking better; I’m talking about a unified design that attempts to have aesthetic value. You’ll better understand what I mean by “aesthetic vision” when you read the reviews. 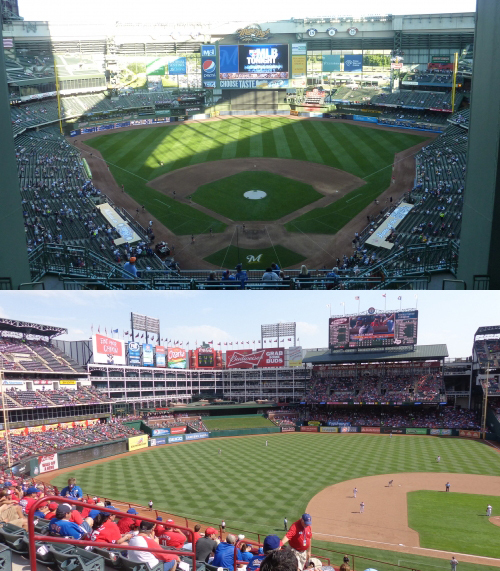 Miller Park vs. Rangers Ballpark in Arlington. Both are enclosed, but one has aesthetic purpose while the other is simply functional. This is a good quasi-objective starting point. 2) Is the outfield design connected to its context and responsive to the forces of the environment, implying aesthetic attractiveness and visual distinctiveness? Letting the surrounding area take over is an easy way to look aesthetically attractive and stand out, with few exceptions. How does it all come together? Everything should be in perfect proportion. How is the space used? Does the overarching design take the overall context into account? Is contextual space enhanced, or neglected as a neutral space filled with gimmicks and diversions (Great American Ballpark). While distinctiveness doesn’t mean it is attractive, it usually implies an effort to operate under a different aesthetic vision. But here’s the main point I’m getting at: any ballpark that responds to its environment is going to be visually distinctive/attractive to some degree, because it shows the uniqueness of its own city. 3) Is the overall seating structure visually distinctive, aesthetically attractive, authentic, and well connected to its context? 4) How do the actual elements of the interior design, not the backdrop, reflect the region or city? 5) Is the interior design visually unified under a single concept? All of the elements should be well connected. 6) On a similar note to number 3, does the outfield have an open and airy design with minimized outfield seating that places the context into the ballpark? The fan should feel integrated into the setting, and keeping outfield seating to a minimum is the easiest (and best) way to accomplish this. Ask yourself this simple question: does it look like you can literally hit a home run out of the ballpark? Now that’s good connection to the surroundings. 7) Is it distinguished with a signature element(s) that emphasizes the design? A great ballpark doesn’t need some artificial loud element, but it certainly helps to have some authentic element to tie everything together. See Camden Yards. 8) Is it confident in its architectural lines? Meaning is the fundamental underpinning of the design muddled with unnecessary features, ads, and gimmicks that contradict the form, or is it emphasized through organic accents? In other words, it shouldn’t be busy and gimmicky. 9) Are all of the individual features contextually appropriate? If it’s in a suburban setting, there’s no reason why it shouldn’t be symmetrical like Kauffman Stadium or Dodger Stadium. Are the quirky retro dimensions authentically derived from the site? The aesthetic value is more important, so I don’t care too much, but if its contrived, that naturally takes away some of the appeal. 10) Note all the supplementary elements, such as the color scheme of the ballpark, ads, batter’c.s eye, field, etc. 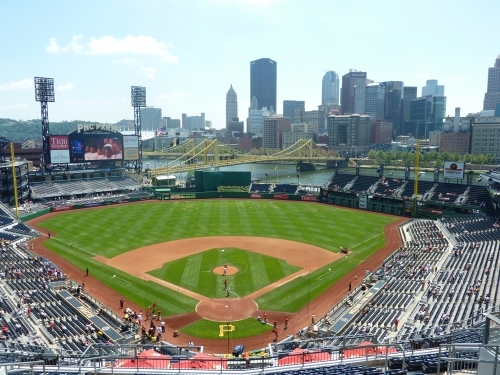 PNC Park is beloved because it’s so tangibly connected to the city. If you think that just means I’m talking about view itself, take note of the derided Great American Ballpark, which is also on a river but has a design that shuts out the view. Target Field’s interior limestone accents recall the region. Panoramic View/Backdrop (x/5): While this may seem redundant, I added this as a separate category in order to supplement the weight of the interior aesthetics and continue to stress the importance of physical connection to the area, which is probably the most important aspect of the interior design. Whereas components of the interior design category measure the connection of the interior to the surroundings, this simply measures the aesthetic value of the viewable surroundings themselves. If the ballpark was purposely enclosed for aesthetics, meaning enclosing the ballpark was part of the appeal, it will be taken into account. Rangers Ballpark is the only ballpark that comes to mind. Beside that exception, if you don’t have some sort of view of the surroundings beyond the outfield, aesthetics are inherently sacrificed, as you will be glaring at seats. If you think about it, the wide majority of ballparks figured this out and attempted to integrate the surroundings in some fashion. AT&T Park: the view of all views. 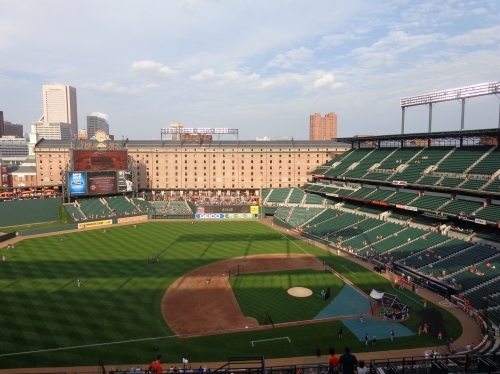 Sightlines (x/10): Every fan says their ballpark has the best sightlines. While improvement is obvious in an era of baseball-only facilities, we are going to systematically measure sightlines. While some are certainly better than others, it should be noted that there is not much range in the scores here: most baseball-only facilities have very similarly adequate sightlines. Take a look at the articles on seating geometry and field proximity for more information. 1) Do the seats provide unobstructed sightlines of the wide majority of the action? Almost all ballparks have no problem passing this test. 2) Are the seats down the lines oriented toward the infield in some fashion? 3) Are the upper levels aggressively cantilevered over the lower bowl while attempting to mitigate overhang issues below in some fashion? 4) How high are the upper levels in relation to the field? By how high, I mean the first rows of the upper decks. Just because a park builds a bigger upper deck (Chase Field), it shouldn’t be punished. 5) How close are the seats to the field behind home plate and down the lines? Seat Comfort (x/5): This category may seem straightforward, but it stands out in one sense: the current industry standard is not as high as the standard set in the past. When Candlestick Park opened in 1960, no seat was less than 21 inches wide, two inches above the current industry standard. No, I’m not condoning the increasing waist size of America or necessarily saying 19-inch seats are inadequate. But it is completely unprecedented that today, 50 years later, after the greatest stadium renaissance in American history, in the age that gives fans incredible amenities, Candlestick is still two inches above the current industry standard. And its not like Candlestick was the only park. Most cookie cutters, such as Three Rivers Stadium and RFK Stadium, sported 20-21 inch seats throughout the stadium. RFK even had more legroom (36 inches), but I can’t find the data on any other older stadium, but it certainly could reflect the entire era. And look at the Astrodome: still the most opulent palace in American history in many ways. 20-21 inches and ALL padded! Most were theatre style padding, while the cheap seats still utilized more padding than our modern day club seats. 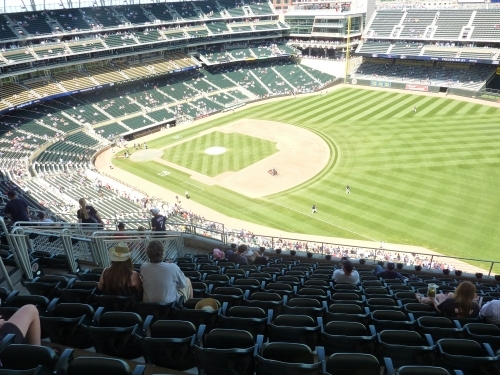 While most new ballparks have 18-19-inch wide seats in the common areas with 21-24 inches in the premium areas, 18-inch seats almost always fill out certain cheap sections of the park. For example, Target Field’s left field deck has narrower seating than the same area of the Metrodome. This is more evidence that indicates the average fan’s situation has actually gottenworse with the rise of the new ballparks. Artificial price differentiation is likely to blame: the logical benefits of padding and making the seats slightly wider for everyone outweigh the current costs of doing so, but teams want to reserve these amenities for premium seating only. If all of the seats are padded and comfy, the marginal benefit of sitting in a club section decreases. Wanting to make new ballparks feel small and intimate, thus squeezing over 40,000 seats into a small structure, also plays a factor. 1) Is the wide majority of the seating fold down variety? Bleachers with backs are acceptable (and preferred) in certain circumstances. 5) Are they padded in appropriate locations? Listed seat width comparison of ballparks in 1999. Many reported numbers are exaggerated; 18-inch seats appear to fill out certain areas of PNC Park, for example. Seat Comfort is another category where new ballparks have consistently not met industry standards set in the past. Scoreboard System (x/3): Every year, the standards get raised higher and higher. Simply just having a HD video board doesn’t warrant a 5 rating anymore. Every new ballpark should have a new, state-of-the-art HD view board with highly informative stats and updates. 4) Out of town scoreboard. Many teams who upgraded to video board systems use video boards to show the out of town scores, which often means that there is not a board exclusively dedicated to out of town scores. If there’s a video board used for that purpose, it’s often used for ads in between innings. While they are going away from this trend, a board exclusively dedicated to out of town scores is appreciated. A manual old fashion board works best in my opinion for a number of reasons, not just for nostalgia. 5) Quality and information of accompanying ribbon boards in the seating bowl. 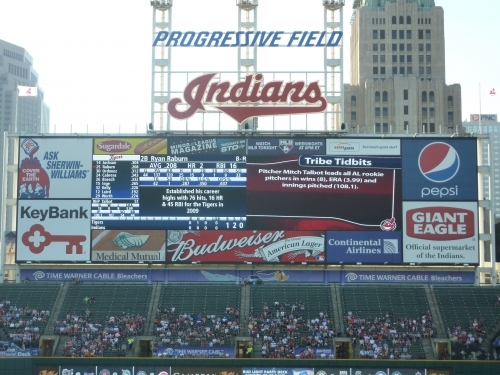 Video board at Progressive Field. Once the world’s largest in 2004, it has since been surpassed by many teams in baseball. 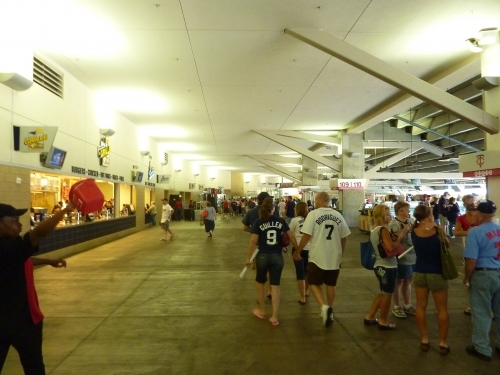 Concourses (x/7): It is a trend for new ballparks to have concourses that are nicely decorated and open to the field of play. The size of the concourses and efficiency of movement is also considered. From an economic perspective, circulation is a priority to promote commerce. The concourse design is easily the most underrated aspect of a ballpark. 1) Are they open to the field on the lower, club, and upper concourses? Does the lower concourse intuitively encircle the field on the same level? 2) How wide are they? Is the space efficiently used? 3) Are there well appointed standing room areas throughout the concourses and in the outfield? 4) Are the aisles well designed and wide enough in the seating bowl? 1) Are they aesthetically pleasing? Color scheme, design of concessions, signage, and other elements that add to the aesthetic value to the concourse are considered (club levels are excluded, in premium seating). Do they provide views of the area on the other side? I note even the concession and section signage design. They should have high ceilings and be open/airy. Attractive concourse at Petco Park. Premium Seating/Clubs (x/5): Premium Seating is the driving force behind the building boom of the last 20 years. This is another category where there’s not much range between the scores, as the premium-seating model is fairly consistent from park to park. 1) Conforming to the new trend, the shear number of luxury suites is no longer indicative of the quality of the premium services. The corporate appetite has diminished for traditional luxury suites as sporting facilities have come up with a wide array of innovative premium options. 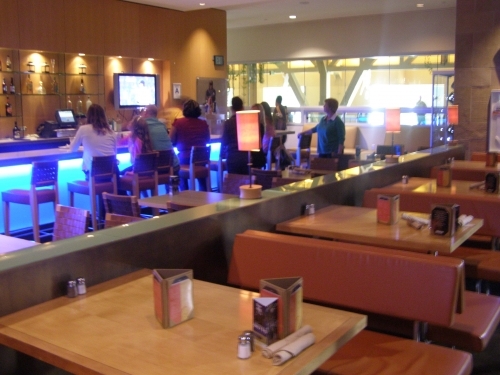 The standard is to have number one VIP home plate club and one mezzanine club. Newer ballparks exceeded this standard, offering more than two options. How many clubs/suites are there and are they luxurious? 2) Is there a premium club restaurant with a field view? 3) Are the premium services done in a particularly innovative way in comparison to its competitors? Premium concepts such as loge boxes, which haven’t spread significantly into the baseball market, would be a welcome addition. 4) Are the premium areas attractively and discretely integrated into the ballpark so that the ballpark maintains a somewhat egalitarian look? 755 Club at Turner Field. Quality and Selection of Concessions (x/5): The quality and selection of the food at a ballpark is something I’ve begun to scrutinize at a high level. Good food is not only important in itself, but it is particularly key in giving the ballpark a regional feel that reflects the city. Due to the nature of baseball, fans are willing to wait longer for quality food than in other sports, again stressing the nature of the ballpark, separate from the stadium, in providing a quality experience for the fan regardless of the game. Ballpark food can be provided by a number of high quality local establishments (preferred), fast food chains, or food service corporations (Aramark). Usually, it’s a combination of these three. One factor I peripherally consider is how well the ballpark serves its market demand. New York is obviously going to have a wider variety of concessions than Kansas City because the demographics. So I try to consider that dynamic as well. 1a: Variety of items offered in accessible areas of the ballpark. 2) The variety of the following secondary items: deli sandwiches, other specialty sandwiches, BBQ items, Mexican/Tex-Mex/Latin, Asian, and seafood. Only a few are able to offer all of these, and it is often contingent on the location and market. 3) Healthy items, such as salads, smoothies, wraps, fruit, hummus, etc. Dessert items such as Ice Cream, coffee, funnel cakes, candy, milkshakes, pastries, specialties, ext. 4) Selection of specialty hot dogs: think Chicago Dog, Texas Dog, New York Dog, Cincinnati Cheese Coney, Southwest Dog, Coney Island Dog, etc. 6) Any other unique miscellaneous items that don’t fall under #2. The varieties are pretty endless, and sometimes build off of the basics mentioned in #1. 1b) Quality of the concessions offered in each of the aforementioned items. Some parks, like Chase Field and Angel Stadium, have all of the bases covered in terms of variety, but the offerings consist of national chains. In other words, it feels like mall concessions. I look at the reputation of the food, the providers, (Aramark, fast food chains, or renowned local establishments), the facilities, the presentation, and my own taste to determine the level of quality. 3) Quality of the offerings at the non-premium public restaurant(s), if there is one. 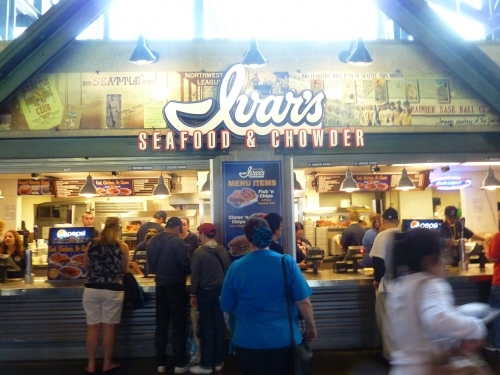 Ivar’s concession stand at Safeco Field. This is an example of a local concession chain at a ballpark. Regional/Signature Concession(s) (x/2): Here is a category that gets a surprising amount of press. What food item (s) on the menu distinguishes the food selection? 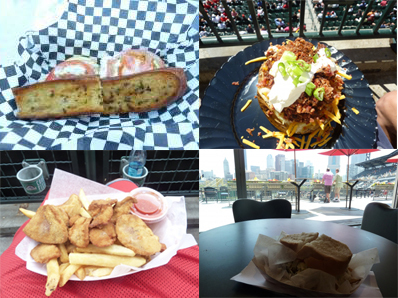 A ballpark’s signature food should reflect the ballpark’s regional theme and culture. It’s become a category in its own right and important for the ballpark’s personality, in an era of the “retro cookie cutter.” They generally fall into two categories: 1) local delicacy provided by local eatery that’s a staple in the region (Primanti Bro’s Sandwiches in Pittsburgh). 2) Simply a unique regional food item that can’t be found in other ballparks (Rocky Mountain Oysters in Denver). Or both, I suppose. Either way, this category simply asks the question of how well the food options represent the region. Because the highest scores often stem from the presence of multiple high quality local chains, this can be seen as an indirect measure of quality. 1) Do high quality regional chains in the park serve the local cuisine? How well does the unique item (s) reflect the regional cuisine? 2) How unique is the item(s) or eatery (s) served in comparison to its peer ballparks? Do they serve multiple regional items? Famous signature foods from around the major league scene. Crazy Crab’z sandwich in San Francisco. Texas sized loaded BBQ Baked Potato in Houston. Primanti Bro’s sandwich in Pittsburgh. Rocky Mountain oysters in Denver. 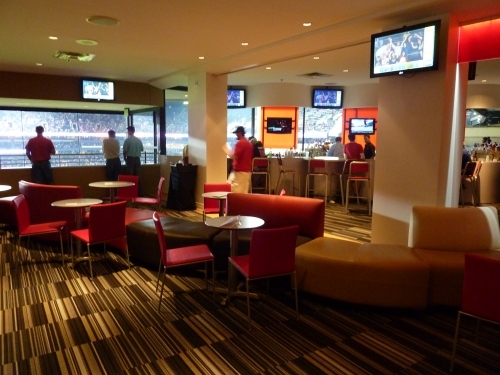 Accessible Restaurants/Bars/Sitting Areas/Social Spaces (x/5): While not too big of a deal, all modern ballparks are expected to have public restaurants or lounge (non-premium) areas, some of which sport a view of the field. By “public,” I mean open to all paying fans. The design of the restaurants, quality, quantity, selection, and view is taken into account. Premium Stadium Club restaurants aren’t counted here. 1) Does the park have a public restaurant with a view of the field? 2) Is there a public sitting area or refuge to eat or drink on the main concourse and/or the mezzanine/upper deck concourse? 3) Quality of the restaurants and sitting area. Club 19, named in honor of Tony Gwynn, on the now accessible terrace level at Petco Park. Many ballpark restaurants house memorabilia or honor a specific player in franchise history. Entertainment/Kids Activities/Other Amenities (x/3): The ballpark experience at our new “retro” facilities is responsible for the sustained appeal. Conventional wisdom says entertainment features are necessary to keep families coming to the ballpark. 3) Is the entertainment for kids tastefully done? It shouldn’t interfere with the baseball experience and be out of sight for most fans. 4) Are the in between inning games appropriate and kept to a minimum? 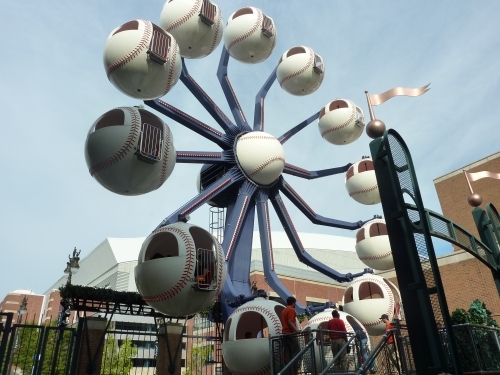 Ferris Wheel at Comerica Park. General or Artistic References to Baseball or Team History/Museums (x/5): If a team has a long and storied history, it should be reflected in its ballpark. If you didn’t know where you were, would you know that this ballpark belongs to a certain team? Every ballpark should have the character of the team that plays in it. More than other sports, baseball is an inherently historical game, so every new ballpark is packed with references to history. Is there a museum/monument area in the park, whether it is dedicated to the team or to general baseball history? Is there a mention of the team’s history in the general areas of the ballpark (i.e. concourses)? 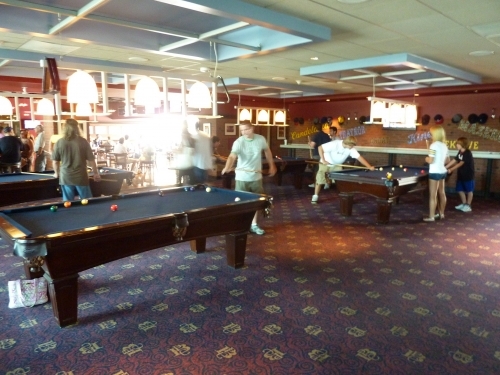 Is there a mention of the team’s history in the club, restaurant, and lounge areas? Are there statues, banners, plaques, and/or other references to the team history? If there is no history, do they tastefully recognize baseball history in the area in some fashion? Is it all done tastefully? Are the retired numbers, championship banners, etc. presented tastefully in the ballpark’s interior? Is the local history of the area honored in any way? 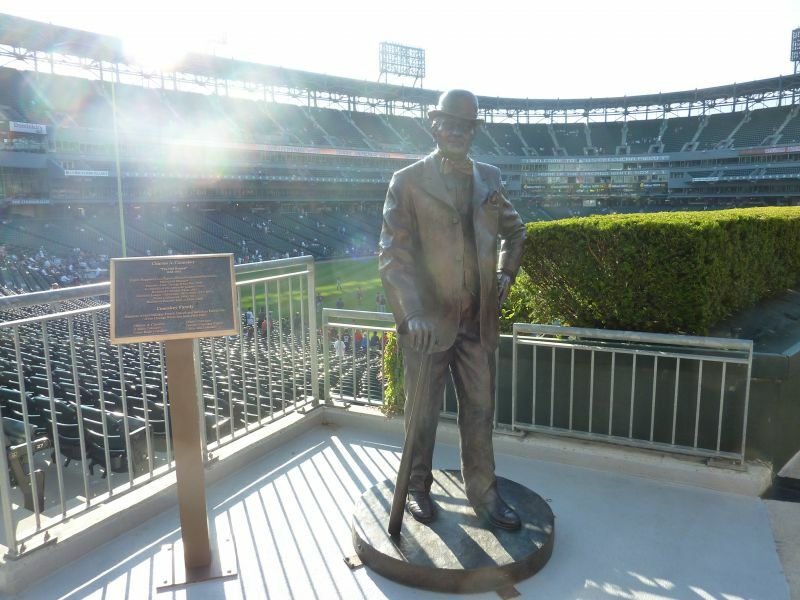 Charles Comiskey statue at U.S. Cellular Field. Atmosphere/Fan Support (x/5): History has told us that fan support can single handedly make a ballpark legendary. Since fans actually being in the ballpark influence the ballpark’s atmosphere the most, attendance is weighted higher than tradition. Important Note: This is probably a category that most think I undervalue. But remember, we are judging the ballpark, not the fans. Most importantly, I allocate only 5 points because there is high variability. From year to year, you’re either in the pennant race with high attendance or not. Contrary to popular folklore, there’s little practical difference in fan noise or atmosphere at full capacity from one winning city to the next, with a few exceptions. And once you are done simply gauging attendance from year to year, saying one group of fans is more loyal than the other is just too subjective, without more research. Randomly saying X’s fans are better than Y’s fans based on a couple experiences isn’t sound science, and it’s likely to offend people. On the other hand, special fan traditions will be given generous extra bonus points. 1) Attendance numbers during this season. Takes variability into account as well. Does the team have a steady season ticket base to ensure the park is never too empty? Places like Turner Field may have an average attendance in the middle of the pack, but also have a ridiculously low floor in April of around 14,000. Compare that to a place like Minute Maid Park, which didn’t go below 20,000 before 2012, despite the lower overall average. Ballpark Policies/Customer Service (x/2): I decided to count this as only 2 points because it is impossible for me to objectively evaluate the entire usher staff. Believe or not, this is actually done around the major league scene by “secret shoppers.” In new ballparks, the ushers are generally well trained and there is little discrepancy from ballpark to ballpark. So basically, what this category boils down to is how fan friendly the policies are. Do they allow you to explore all common areas before the game? Yankee Stadium and U.S. Cellular Field pretty much get a 0 here. 1) The policies of the ballpark are considered: are you allowed to explore different levels and go down to watch batting practice before the game? Other policies such as reentry procedures and what you’re allowed to take into the ballpark are considered. 2) Efficiency and friendliness of ushers and customer service personnel; this highly varies in a ballpark and is difficult to objectively gage, so it’s not as highly stressed. 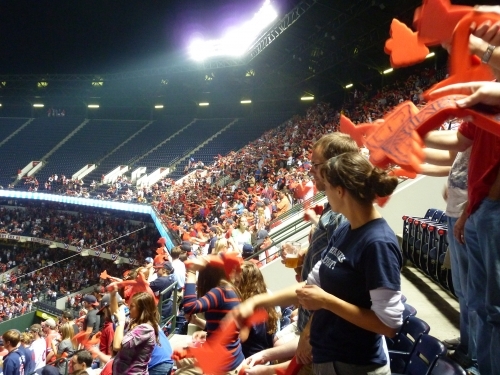 Tomahawk Chop at Turner Field during game 4 of the 2010 division series. Bonus: Since bonus points theoretically put us over 100, I try to be relatively strict, but usually end up being pretty generous in awarding these points. It usually takes form in praising extraordinary features that deserve extra points beyond those originally allocated. Other important aspects of the ballpark that isn’t significant enough to warrant its own category are sited here as well. If there is something truly different about this ballpark that deserves praise, I site it here. Regardless of distinctive interior design, does the ballpark pass the “where are you” test? Quality of the team in the ballpark. Usually reflected by the attendance and atmosphere. So in a way, it’s indirectly measured. Prices: Prices are often reflective of the quality of the team and the market. Yankee Stadium and Fenway Park should not be punished just because fans are willing to pay higher prices and PNC Park should not be honored because they are slashing prices to get people in the park. So in no way is this a “fan value index, ” like the Sports Illustrated ratings.